Join us on Tuesday 6th August – walk from The Caves to Rockhampton, or for a lovely afternoon gathering in Kershaw Gardens. Friday 9th August there will be music and fun at Emu Park. Saturday morning at Rosslyn Bayon from 7.30 to 9.00 am for breakfast, and then a boat trip around the beautiful waters of Keppel Bay and the Fitzroy Delta to Port Alma where walkers will continue the journey. See below for details or the itinerary page for more information. GET INVOLVED! Meet walker June Norman, a spirited and determined great-grandmother who is passionate about saving the Great Barrier Reef. Put your walking boots on and join the ReefWalkers as they make their way along Yaamba Road to Kershaw Gardens on 6 August. Or welcome them at Kershaw Gardens from 3-5pm… enjoy some music, meet June and hear her story, and stay for a chat. Meet-n-Greet ReefWalk Event with South Sea Islander & Keppel Sands Community, 6pm – 8pm at Mabel Edmund Park. Please bring a plate of food to share. Hear June’s message, share stories, information, campfire. 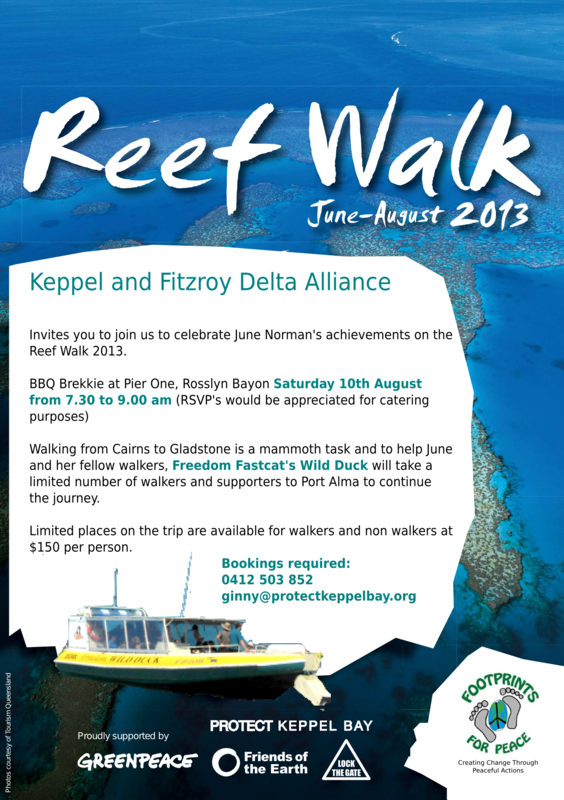 Come along and meet June Norman and the ReefWalkers and CELEBRATE! at the CWA Hall in Emu Park as they near their journey’s end (less than a week of walking left). Let’s share the love we have for our beautiful Keppel Bay and islands and our lifestyle. Lots of fun stuff planned – live music, local bands, Peace Choir, singing, dancing, bring your guitar, meet June and hear her stories. She is a living, walking legend and her passion for action to save the Reef for future generations is infectious and inspirational! Locals, please bring a plate of food to share. Rosslyn Bayon Saturday 10th 7.30 to 9.00 am – boat trip! Walking from Cairns to Gladstone is a mammoth task and to help June and her fellow walkers, Freedom Fastcat’s Wild Duck will take a limited number of walkers and supporters to Port Alma to continue the journey. Limited places on the trip are available for walkers and non walkers at $150 per person. The Wild Duck leaves at 8.30 for a trip through the beautiful waters of Keppel Bay and the Fitzroy Delta to Port Alma where walkers will continue the journey with June on foot and Supporters not walking will cruise the waters currently earmarked for port development before returning to Pier One at Rosslyn Bay by approximately 3pm. BYO lunch and drinks. Local walkers not joining the boat will need to make their own transport arrangements to meet the group at Port Alma. Walkers going should be prepared to walk from Port Alma that afternoon and camp overnight at Bajool or arrange a pickup. I’m envious – oh to spend a few days on the Keppel Coast! This would certainly be the best time of year for it. I’m sure you’ll all enjoy being there – and hope you find some organic food there as well.